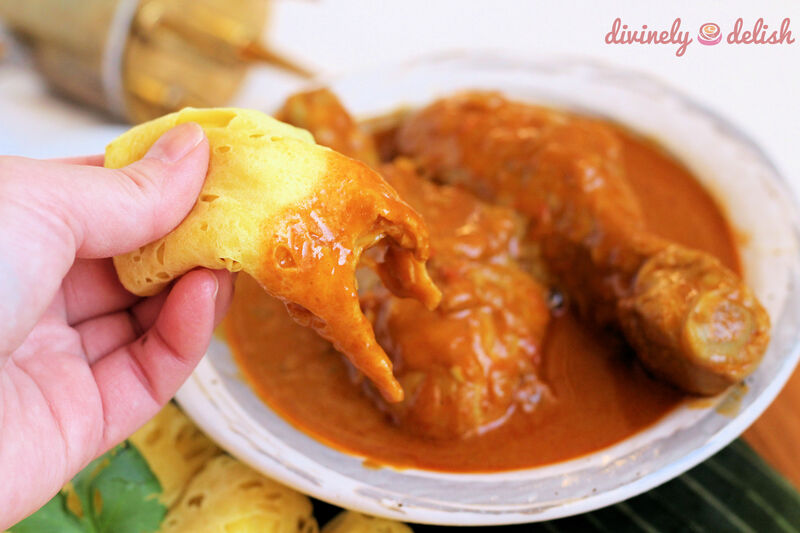 These Malaysian roti may not be as well known as Roti Canai, but they’re definitely prettier. 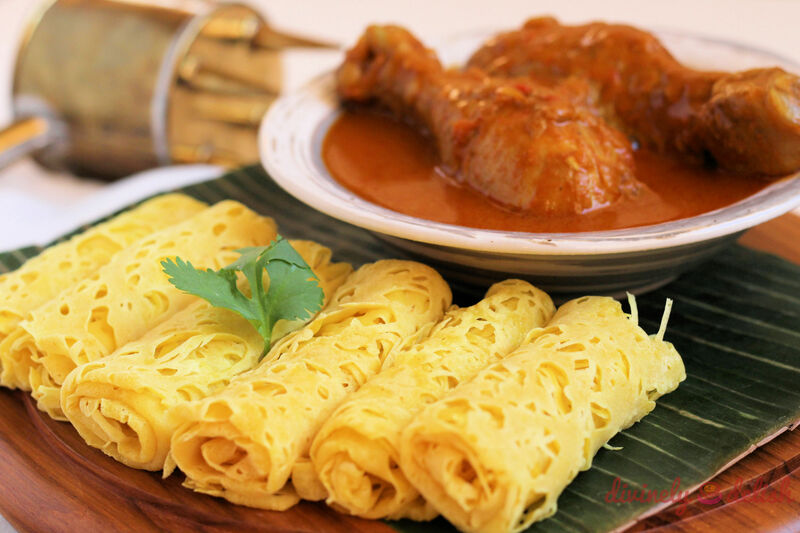 Roti Jala are made by pouring batter into a cup-like ladle that has four or five small funnels, and moving it around in a circular fashion over a pan to create what what can be described as “lace” crepes. 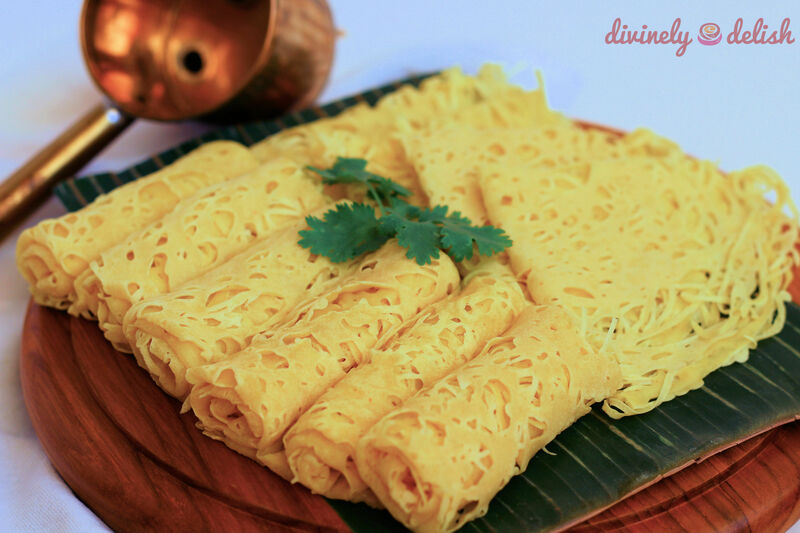 They are served rolled up like spring rolls, or folded into quarters, and are excellent eaten with curries. 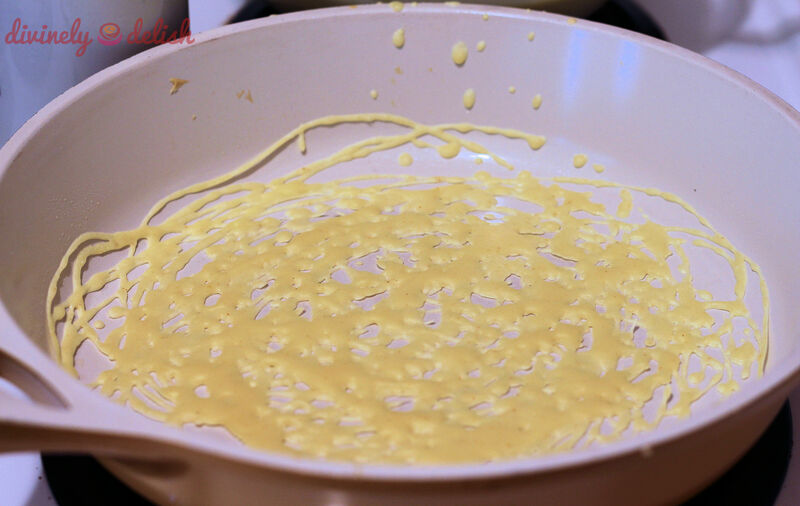 The net-like crepes are great for sopping up sauces and are a nice alternative to rice! 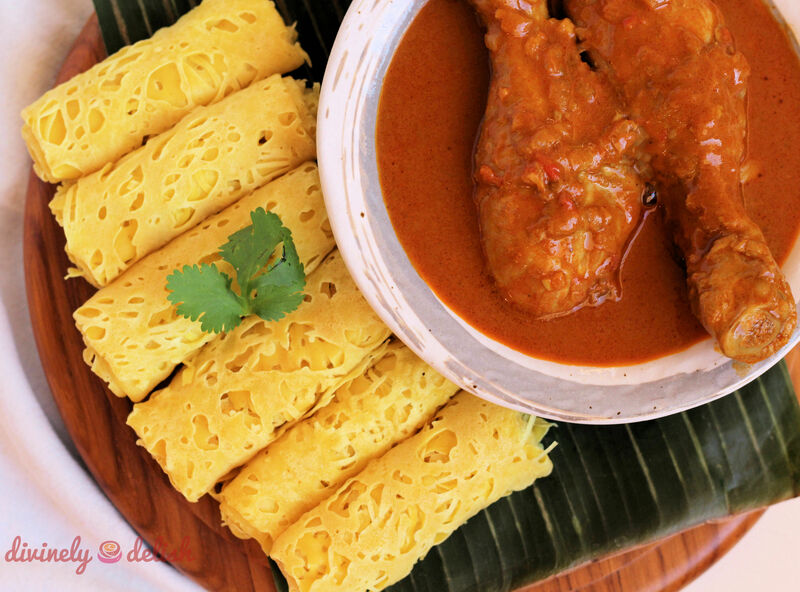 I hadn’t made Roti Jala in a long time, but decided to recently, when I cooked some chicken curry. I could also finally use my mother’s old Roti Jala funnel that I’d found while digging through her kitchen cupboards last year. It’s one of the traditional brass ones which aren’t so commonly seen nowadays, so I feel pretty lucky to have in my possession this piece of antique! Nowadays, you’re more likely to find plastic ones. If you don’t have this utensil, you can just improvise and use a squeeze bottle, like what I used to do. I like to call this a simple, no-fail recipe, although it is quite time-consuming, so you will need patience! But it’s so worth it because these crepes are not only tasty, they make quite the impressive side dish. 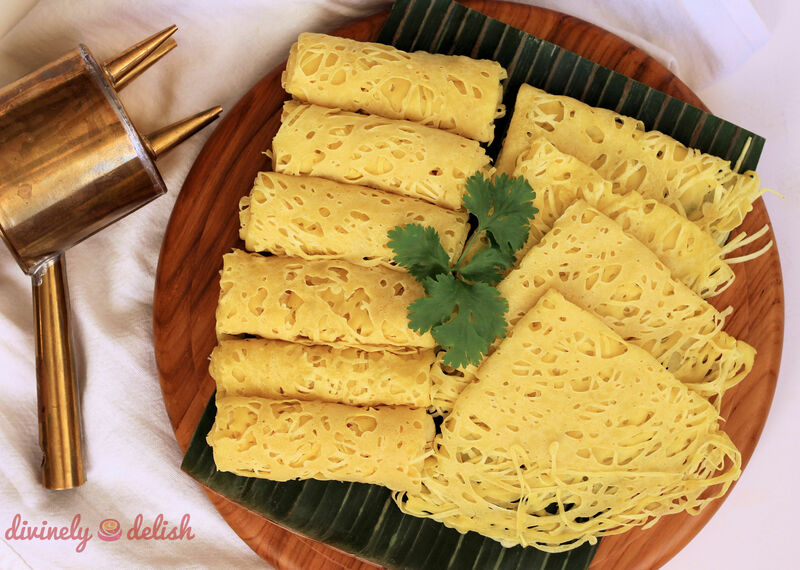 And if you find yourself with leftover Roti Jala, you can get creative and turn them into sweet crepes! 1. Sift flour, turmeric and salt into a large bowl. 2. 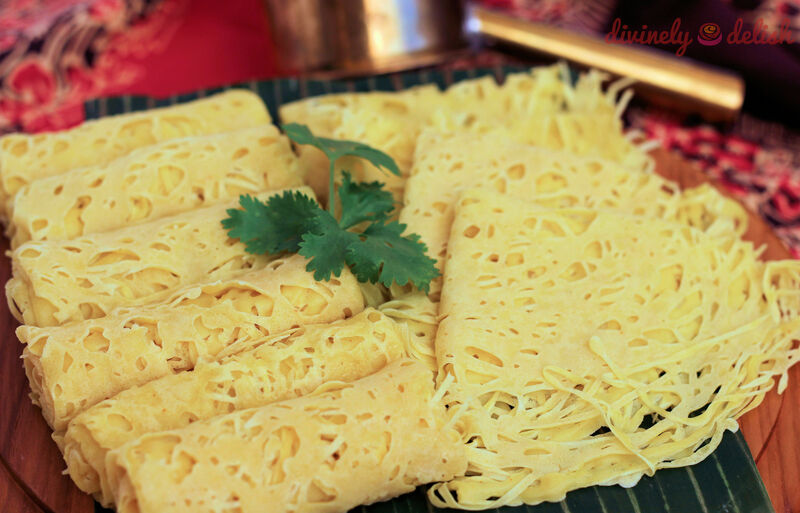 Make a well in the centre, add beaten eggs, coconut milk and 300 ml of water (this consistency is fine if using a squeeze bottle for making the Roti Jala; if using a Roti Jala funnel, add in an additional 120 ml of water, since a runnier consistency will be needed for the batter to flow through). 3. 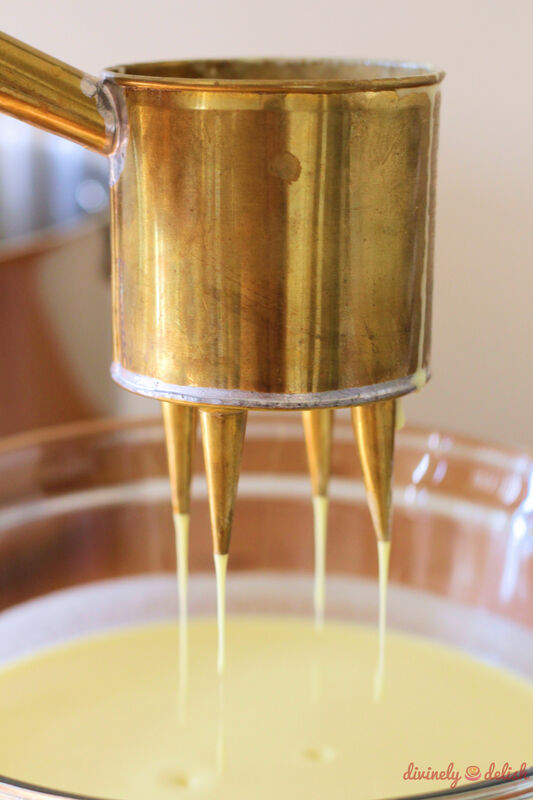 Using a whisk, mix well to get rid of any large lumps, then strain to get a smooth batter. 4. Cover bowl and set aside for 30 minutes. 5. Heat a non-stick pan over medium-low heat (I used temperature dial 3 on an electric stove top) and brush pan with a little oil. 6. Pour enough batter to fill about half the funnel, and quickly move it around in circles over the pan. You want to use just enough batter to create a lattice pattern. Cook for about one and a half minutes, or until batter has set, then remove to a plate. There’s no need to cook the other side. 7. Once cooled, fold each crepe into quarters, or fold both sides to overlap in the middle, and roll it up. Best served with a curry. Hi! Welcome to my blog and join me in my culinary and travel adventures!